Ok so it's been forever, and for me that is not good because I love going back and remembering everything. So I am going to give a quick run down of our summer and fall! Summer came and went even faster. It was crazy four little ones going in all directions. The boys enjoyed going to sports camp and couple of time each month. We all did swim lessons and then we just played. It did not seem like we did a lot this summer, but we spent a lot of time together. Mom and the kids! Dad was crazy as always. Business is good and that makes us all happy! Spencer is now in the 4th grade and trying his best! He loves fishing and riding his bike and scooter! He still loves to cook and do yard work as well. Ryan is now in 1st grade. Loves everything, he is such an easy going little guy. Unless you take him to a store and buy him nothing, then you see another side of him!!! Aubrey is 5 she is still in preschool, which is both bad and good. She just like to know where I am ALL the time. For some reason turning 5 made her want me even more! But we have a good time together. She loves to ride her bike all by herself and play with friends, as long as they are doing what she wants. She has a huge red personality already! Emily is now 2! It is weird to think that my baby is two and is so much fun. She does not say much yet, only the important words! No and mine are her favorite and I think she thinks her name is ME because we call her Emy and you ask her what her name is and she says ME! It's cute. She loves to ride on her liltte red scoot thing, not sure what it is called. She is fearless and loves to be with the big kids. Tyler as I said is very busy. ColdCreek is doing very well. It is so rewarding to watch something you work so long and hard for! Me, well I am enjoying my days! I was enjoying working out about four days a week, but somewhere I lost the motivation!!! I hope to get back to that because it was both good for me and very fun! I am staying busy with the housework, school PTA stuff and also I have joined the community council so I am trying to find different things to take up some time!!!! I have been baking a lot lately and just trying to be the best mom and friend to others that I can. I love the blessing of being able to stay home and be a mom. I did do some home improvements with a friend of mine while Ty was out of town for a week!! Those of you who don't know my husband well, that is huge for me because I have never been able to do anything in my house--- hanging up a picture was for him!!! He is to busy to care anymore and loved what we did!!!! Even the hot pink! So more projects will come!!! Enjoy the small movie I put together so I could combine a ton of pictures! So after many weeks we finally got the carpet in and we could play! The kids loved it down there and I love when they are down there!! There is still a lot of finishing touches, but it is a place to play for now. Tyler the wonderful and talented man that he is did all the tile work again and I love it. My purple wall, yep bright purple, that's my room. I will have my workout stuff down there as well as all the craft and school projects. I wanted the room to make you smile so that I am happy when I am there doing things!!! Tyler got a room to, we call it the man cave, currently it has no paint or walls and a cement floor, but he is happy with it!!!! Ok so the project began in early December, thanks to some great family and friend we framed up the basement in just about a day. It was now time for the fun stuff! Oh wait the holidays have to fit in there so the basement had to wait. Finally we got all the guys here for the before the walls go up stuff. 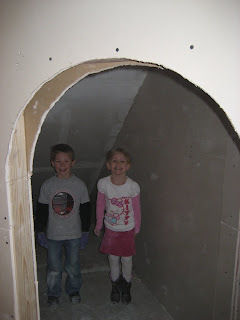 Then the MESS of the sheet rock. I guess I really did not know how much MESS that was going to be. But word the the wise it was the messiest thing ever! With the sheet rock up these pictures tell the story. Spencer is standing in his new room with his closet. Ryan and Aubrey are playing in the new princess house. (so cute) and then the family room. Well I wish I could say I have a ton of pictures from this day, however they are on the flip and right now I have no idea how to really get them on here! I will figure it out one day. Or just not use it on holidays!!! Christmas was fun this year. The girls got a huge kitchen and the boys got nerf guns and Spencer got his hunting game for the WII Ryan got a tag and a fishing game. It was fun to have everyone over and enjoy the days around this special time of year. Ok so here is a quick update, these pictures are from Christmas eve and the fun around that time. We made our first turkey ever this year and it was WONDERFUL thanks to a yummy brine that we got from a friend. The turkey was marinating for 4 days!!! Yummy!